This is a very untypical book choice for me but Andy Weir pulls it off! Who would think that someone could write a whole 400 pages about a man stuck on Mars and still keep it interesting - well, apparently Mr. Weir can! I saw this book on my Wednesday wander through all the Yarn Along posts and the story seemed like it would be something that could be worth a read. The story is about an astronaut who gets left behind on Mars through an unfortunate event and has to fend for himself until a rescue party can be sent to fetch him. I found that the author managed to capture the Mars terrain and feel very well, and could relate well to his imagery. 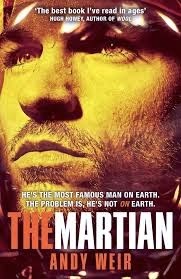 I felt that the way he described the events and surroundings to be very plausible (I am by no way even remotely clued up on how Mars could possibly look or feel) which made me root for the main character - Mark Watney - that much more. It was like going on an adventure in a Mars Rover with a very human astronaut as a guide! I am thrilled to see that the movie comes out in November this year (Matt Damon will be playing the main character which I think is a perfect fit for the book!) so if you would like to read the book before the movie, now is your chance! You can find my Book Rating Chart in the Sidebar.